Any sentence containing the words “management” and “Pryor Mountain Wild Horses” is typically unpopular. Popular or not, this is something that I feel is very important to understand. Thus begins our journey into understanding the management of the Pryor Mountain Wild Horses. Please remain patient and open-minded as you read this post and subsequent posts. I always feel it is important to first understand why management must occur. To understand the reasoning behind management, we must first understand where the Pryor Mountain Wild Horses live. I think that it is important to know that the Pryor Mountain Wild Horse Range is fenced. There is a barrier around the wild horse range that is meant to keep the wild horses from leaving. Some of this barrier is actual fence while other parts of it are natural (steep canyons). More importantly, perhaps, is that this is a legal boundary; the law states that wild horses must be within the boundary of the PMWHR. Let’s stop here and understand what the PMWHR looks like today. I say today because it has changed over time. Below are some maps I drew based on BLM documents and reports; these maps show the evolution of the PMWHR. These maps are approximations, but they are pretty close to reality. When looking at these maps (except for the first location map), what you’ll really want to look at is the bold, dark red line. This is the PMWHR boundary. As far as the color of the land areas goes, green is National Forest, yellow of BLM, purple is National Park Service, orange is tribal land, white is private land, and light blue is state land. Streams, rivers, and the like are blue. 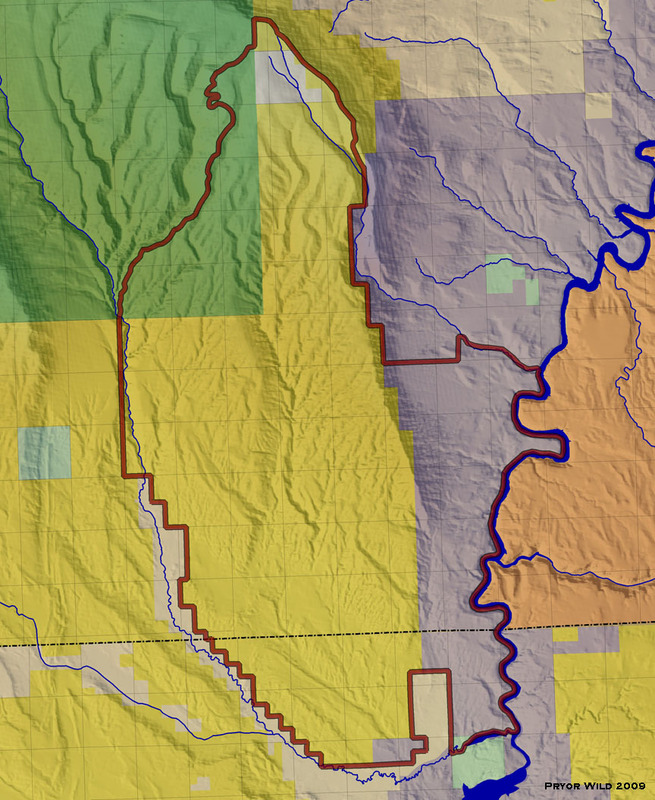 The Wyoming-Montana border is the dashed black line. 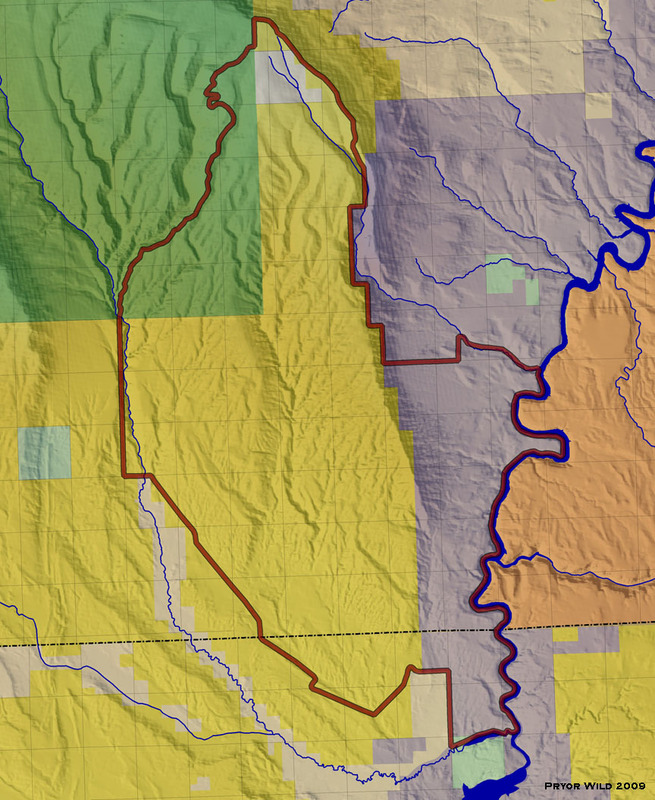 This is all overlaid on a topographical model of the area. To get a feeling for scale, there is a section grid on the map; each of those squares is a mile by a mile in size. North is always “up” on the maps. Feel free to click on these maps to see larger versions of them. So let’s start with understanding where in the country we are actually looking. The area I will be describing is on the Montana-Wyoming border on East Pryor Mountain (the southeastern area of the Pryor Mountains) just north of Lovell, Wyoming. 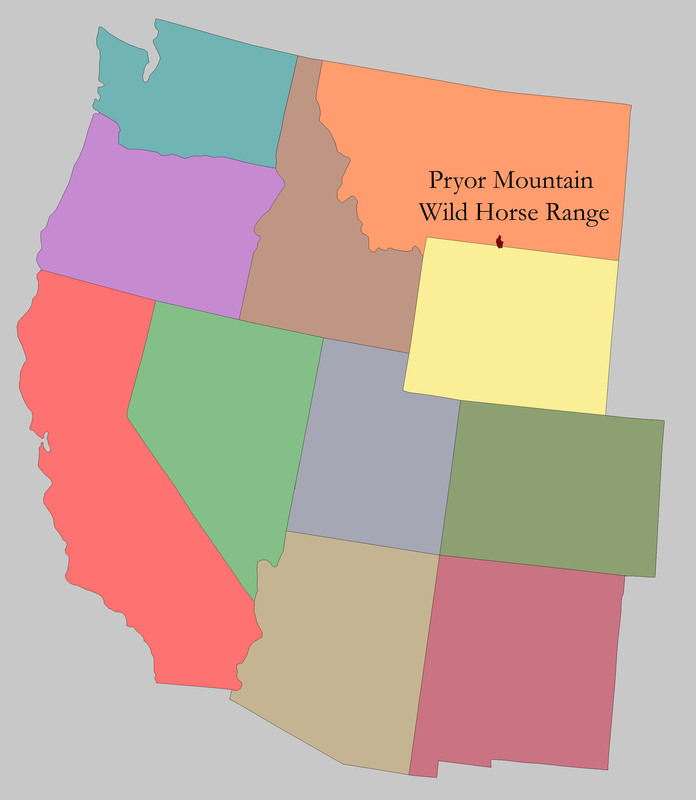 See that little red polygon under the words “Pryor Mountain Wild Horse Range”? That is the PMWHR shown at approximately its actual size compared to the Western states. Now let’s go back in time to the PMWHR in late 1968. This was when the range was first established through an order by Secretary of the Interior Stewart Udall. This original PMWHR was about 33,600 acres. It covered only BLM land and portions of the National Park Service’s Bighorn Canyon National Recreation Area. Remember, we’re in 1968 now. There is no such thing as the Wild Free-Roaming Horses and Burros Act, and so the aren’t a whole lot of rules and regulations concerning wild horses compared to those of today. Up until this point, I’ve shown you some maps with boundary lines drawn on them; and I am telling you that the Pryor horses are supposed to stay within this boundary. So what’s keeping them in there? The following map shows the different parts that make up this boundary. Each different color of line corresponds to a different boundary which is described with the label near it. Thus, in the PMWHR, and all other wild horse areas, there is a plot of land of a certain size that wild horses live on. Because the land is a certain size, 38,000 acres, then it produces a certain amount of resources. This certain amount of resources can support a certain number of wild horses. If there are too many wild horses on it, then the land may start to experience damage. Because the lands of the PMWHR were historically overgrazed by livestock (like most Western lands); and because this area gets very little precipitation, any damage to the land can take a long time to recover, especially if the Pryor horses are applying some small but constant grazing pressure. If the land is damaged and slowly recovering, it is producing fewer resources than it once had. If this is the case, then there will be insufficient resources to support the wild horse population present on the land. At this point, the population must be provided resources; or some of the wild horses will get sick or die due to poor nutrition. To prevent these situations from happening, it is thus necessary to manage the wild horse population. The same could be said of populations of other wildlife in the West. This is a reality of the West in 2009. As you read through this post and upcoming posts, please do keep in mind that we do live in 2009; and so there are some economic, geographic, political, and cultural realities that we just have to deal with. I think that the Humane Society of the United States summarizes all of this well in their pamphlet entitled “America’s Wild Horses: Managing for the Future.” In this pamphlet the HSUS explains why management is necessary through this statement: Given the West’s current state, wild horses left totally unmanaged would suffer periodic mass starvation and in some spots further damage the fragile landscape. With that, start thinking about the ways in which wild horses can be managed. This will be the topic of future posts. Though the Pryor horses get a lot of attention, there are actually two other wild horse herds in the Bighorn Basin besides them. Both of these herds recently had gathers too. I got some figures from these gathers from the BLM today to post here. The McCullough Peaks horses are near Cody. They were gathered last week. During the gather, 191 horses were brought in with 94 horses being removed and 97 being released. Of the released horses, 34 females were treated with PZP. They also estimate that there were around a dozen horses not gathered. The Fifteenmile horses are near Worland. They were gathered this week. During the gather, 377 horses were brought in with 307 horses being removed and 70 being released. No females were treated with PZP. They estimate that there were possibly 10 to 15 other horses not gathered. The 401 total horses removed from the McCullough Peaks and Fifteenmile HMAs were taken to Rock Springs where they will be made available for adoption. There will be more gathers in other parts of Wyoming in the upcoming weeks as well. Yesterday I headed out to Bighorn Canyon to see how the horses there are doing. I first saw Cappuccino and his harem on Mustang Flats. This man-made harem seems to be getting along okay. Cappuccino was pretty wary of us; he had his eye on his from the moment we started hiking to them until the time we got back. I am very interested to see how long these guys stay out on Mustang Flats. I think that Guinevere is one big reason they are out here. She was originally a Dryhead horse, and she spent many years of her life on Mustang Flats. She is 19 years old now. Cappuccino was also born in the Dryhead, though he was soon after stolen with his mother, ending up in Burnt Timber. I am not sure what he’s been up to, but his forelock and tail are completely caked in cockleburs. Nearby was Admiral’s harem. The colt, Exhilaration’s little half-brother, is getting big and sure is looking like his big brother. On the 21st we headed out to the range. After seeing only Sitting Bull and his harem in the Lower Sykes area, we decided to head up Burnt Timber. The snow had melted a lot since I was last there, and nearly all of the puddles in the mid-slope were dried up. Scoping to the top of the mountain, we could see that there was still a good amount of snow up there still. However, there was also a good amount of horses up there too. Drifts blocked our way, so we had to walk in to the horses. Going down the cirque, the first horses we saw were Starman’s harem as his daughter Isadora peeked out at us. Up from them was Two Boots and his harem. The colt foal was still missing, and so I think that he is probably gone. As we continued to walk in, we came upon Lakota and Baja’s harems. The black colt in Baja’s harem is definitely striking, much like Isadora is above. This foal, like the others, is getting big and is growing in his first fuzzy winter coat. Crossing over the hill, we came upon a number of horses – the harems of White Cloud, Teton, Bolder, Blue Moon, and Mescalero. Custer and Coronado’s harems could be seen in the distance. There was a little interchange up there. White Cloud’s black mare Pococeno wasn’t with the harem, but his two year old daughter was back from Morning Star. I couldn’t see her with any of the harems I saw. There really was a good amount of snow on the ground, and there’s not a whole lot of available forage in some of the areas the horses were in due to these seasonal conditions. The snow does provide water for them; and, judging from a lack of water in the mid-slope, I guess that was a big reason the horses were up there. Not all of the horses were up on top, though many were. Some, like Jackson below, had their harems down there still. I’m not exactly sure where they watered, but they are definitely able to take advantage of the great forage that is present in these areas right now.